The department of mineral resources (DMR) has submitted a report that contains recommendations to the National Director of Public Prosecutions (NDPP) for a decision for prosecution related to the mine accident that killed three workers at Lily mine in Mpumalanga in 2016. Ayanda Shezi, spokesperson for the department, said anyone with material interest in the report should request it from the National Prosecuting Authority (NPA). This week, City Press obtained the DMR report, which delves into the Lily mine accident in terms of the Mine Health and Safety Act (MHSA). “The report that you are referring to contains only the remedial steps which are required to be taken by the owner of Lily mine to prevent the accident from happening again [according to the MHSA]. Another report that contains recommendations for prosecution was submitted to the NDPP for a decision. The ultimate decision on whether to prosecute or not rests with him,” Shezi said. Shezi declined to say who the DMR has recommended for prosecution, while the NPA said it was studying the matter and could not say who could face the law if it decided to proceed with prosecution. Joseph Mathunjwa, president of the Association of Mineworkers and Construction Union (Amcu), the majority union in the gold sector, said Amcu was not aware of another report. He said it was bizarre that the DMR produced a separate report, because previous reports of mine accidents included all recommendations. NPA spokesperson Monica Nyuswa confirmed that the NPA had received the DMR’s report. “The Occupational Health and Safety prosecutors of the NPA, based in Pretoria, are [looking into] this matter,” she said. The DMR report found everything wrong with how management failed to prevent workers’ deaths. “From the evidence led in the inquiry, it is clear that the recovery of the three missing employees is almost impossible due to the severity of the collapse,” reads part of the report. On February 5 2016, an entrance at Lily mine’s shaft collapsed and buried three workers: Yvonne Mnisi, Pretty Nkambule and Solomon Nyirenda. They were working in a container, serving as a lamp-room, which plunged underground. The 76 workers who had already entered the shaft were rescued. The DMR instructed Vantage Goldfields to close the mine, at least until the workers’ bodies were recovered. Various rescue missions were undertaken and had to be abandoned after conditions were deemed too dangerous. The bodies were never recovered. The DMR’s report has dashed any hope that the bodies of the three workers can be recovered. Lily and its sister mine, Barbrook, were eventually placed under business rescue late in 2016. The DMR conducted an inquiry into the accident. Its final report was concluded on March 12 this year and given to management and Amcu only on August 8. The DMR is harsh on general workers but not on management. 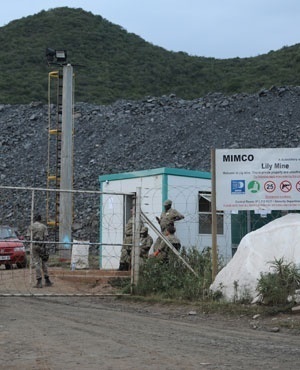 Amcu said it welcomed the inquiry’s findings, but expressed concern that the report did not recommend any criminal prosecution against Lily mine’s management, whereas in previous cases involving mine workers, the department had been harsh. “Amcu welcomes the findings of the report with regard to the causes of the accident. The report’s findings substantially reflect Amcu’s considered views into the causes of the accident, as argued in both the inquiry proceedings and in Amcu’s written submissions to the presiding officer,” said Mathunjwa. “Amcu is, however, unsatisfied and disappointed by the lenient recommendations made in the report. Amcu strongly believes that criminal prosecution against the mine management – in particular, the persons that were employed in terms of section 3(1) and 4(1) of the MHSA at the time of the accident – should have been recommended by the presiding officer,” Mathunjwa said. Mathunjwa said mine-related accidents attributable to negligent conduct by employers would not stop until mine management started being criminally prosecuted. “Similar recommendations have been made in section 72(1)(b) reports against general mine workers. For example, following the death of [a worker] on May 11 2017 in a mine-related accident at Lonmin, Karee 4B shaft, the presiding officer in that inquiry recommended criminal prosecution against the miner whose negligent conduct the presiding officer found to be the proximate cause of [the worker’s] death. There seems to be a reluctance from the DMR to make similar recommendations against management, as is evidenced in the Lily mine report,” he said. Mathunjwa also expressed concern at the report having made no mention of financial compensation for the three trapped workers’ families. The report makes scathing findings against Lily mine management and notes the fact that there had been 10 pillar collapses of falls of the ground that had occurred before the February 2016 accident, which mine management did not report to the DMR’s principal inspector of mines. “Despite this warning, it is unfortunate that the employer at Lily mine chose to ignore [it]. The employer at Lily mine failed to comply with the provisions of the MHSA in that the said employer failed to report the following dangerous occurrences to the principal inspector of mines,” the report found. One of the report’s findings is the failure of Lily mine management to take into account the input of rock engineer Rudi Kersten regarding the location of the main access to the underground workings at the mine. Kersten had recommended that the mine’s permanent access be developed approximately 100m south of the western extremity of the open pit. The safety act obligates employers at every underground mine where a risk of rock bursts, rock falls or roof falls exists, to ensure that the input of a competent person is properly considered and integrated into mine design, planning and operations. The report said no evidence was presented to confirm that the crown pillar was supported to prevent it from falling or collapsing. “It is also a fact,” reads the report, “that, with regard to any roof of any underground excavation, if left unsupported, its chances of falling are greater than when supported by means of an effective support system. “From the evidence presented in the inquiry, it is a fact that the mine was not designed for safe operation, as provided for in [the act]. “The main reason that led to the collapse of the portion of the main pillar is that the crown pillar was not supported to prevent it from collapsing,” adds the report. In February 2016, the container with the three workers inside stood on a 15m-thick crown pillar between the floor of the mine’s main open pit and the roof of level four. The mine has 12 levels underground. The disaster happened when the main crown pillar of Lily mine collapsed. The gold mine, which is situated in Louisville outside Barberton, was owned by Australian company Vantage Goldfields, until black-owned minerals and investment company, Siyakhula Sonke Corporation Flaming Silver SPV bought a 74% stake in the business in March this year.